Building off last Friday’s song post, today’s “numbers-make-the-world-go-round” post is celebrating phone numbers. What would we do without phone numbers? Freak out, is my guess. I don’t need to list the benefits of phone numbers. You all know them. So I’ll just go right into a picture of a phone number. 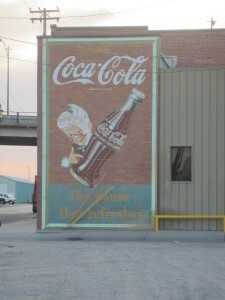 This picture was taken in Kearney, NE. A phone number is great, but a phone number and a giant cow is even better! And “noslime” is better yet! 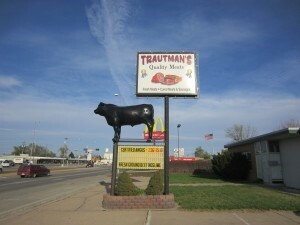 Kearney, NE has a thing for large animal statues. Here’s a rooster crowing about donuts. 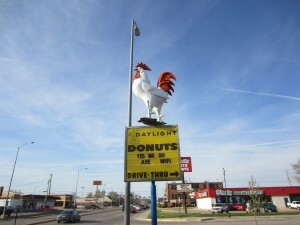 When you’re Daylight Donuts, you don’t need a phone number on a sign, but you do need a barnyard animal. 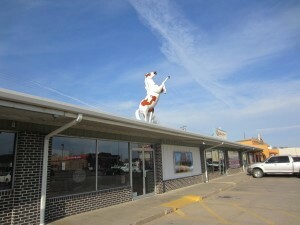 And here’s a horse wishing he were in greener pastures instead of on top of a strip mall roof. And just so you know that Kearney signage isn’t only about animals one finds on a farm, here is a really cool sign on an old brick building. I’d like to buy the world a coke. . .or some no slime fresh ground beef.